These days, the Chinese censorship on media is a highly controversial issue. 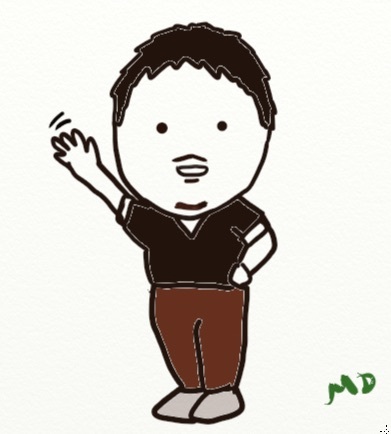 Although it is unlikely to get better, I hope it can hear towards the good direction. Today’s topic is about freedom of expression in Thailand. I’ve been to Thailand twice and had a bad memory about the unreasonable authority. Please be careful. If you criticize Thailand’s King, you will be in a danger. I came across an interesting article from NY times. Mr. Somyot (former editor of magazine company),51, was accused of criticizing the king and sentenced to 10 years in prison. Mr. Somyot did not write the two articles that the court said violated the law, but as the editor of the magazine (the writer has fled to Cambodia). 1. The first article was a jumbled tale about a family that plots to kill millions of people to maintain its power and quash democracy. 2. The second was a fictional story about a ghost who haunts Thailand and plots massacres. The both of them did not mention “king” but it can be refereed by everybody. The court made the decision saying ” King is the top of the nation and should be protected by our nation”. This is internationally criticized as violation of human rights. I wonder what is going to happen. 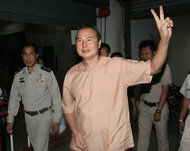 trying to challenge unreasonable rule of the country and never surrendering, I find Mr. Somyot very courageous. Making peace sign after receiving the guilty sentence, what does he mean by this “peace”? This entry was posted in Culture, Human Rights, International Relations and tagged Human Rights, Learning, politics on January 30, 2013 by MD.